Posted this on the course for MAD ABOUT MUSICALS in the "Discussions" tab: Random, but … One of the topics mentioned this week was the contrast between Deanna Durbin and Judy Garland, and "Why would MGM let Deanna Durbin go, and why did Universal capitalize on her appeal and make her a big star?" (6/5 - The Stars of the Early Movie Musical (1920s-1930s))The only thought I had however, was what if Deanna and Judy had teamed up early on as they did in EVERY SUNDAY (1936) for MGM in musicals, showcasing their contrast styles. Modern and Classical combined. In a film series, or in a Mickey Rooney/Judy Garland, Jack Carson/Dennis Morgan, going on the make multiple films together as a screen duo in a TWO GIRLS AND A SAILOR-esque way? Don't know why it's never come to me before in such a way, but thought it would've been an interesting avenue to explore. Daily Dose: The Ginger Rogers/Fred Astaire type musicals vs other Depression era musicals, seems to upgrade, or rather, evolve from "backstage musical" storylines, showcasing a musical about a musical, where the end result or the course of the film is revolving around putting on a show, we now enter into using the natural "two to tango" courtship (for lack of a better word), between the guy and the girl as the musical, which is almost a dance sequence itself in real life. Also, what I've always loved about TOP HAT, is that you begin to see what's the usually "typical" case of the girl chasing the fella role reversed. Where you have Fred chasing after Ginger, as is a similar case in SHALL WE DANCE (1937). i Second that! I've sent in messages in regard to the issue as well, thinking it was just me, but this is effecting the entire site which is disappointing to us who have made the CFU our home for Classics! ssues should have been addresseTCM-CFU not working! Dominique Revue replied to Dominique Revue's topic in Information, Please! Thanks ever so much, I'm very familiar with Bennett Cerf, because I too watch What's my Line?every night on the GSN (right before I've Got a Secret)! But it wasn't Bennett I was in search for I don't think, but I looked it up anyway. However you were correct in looking up Logic Riddle books! I did and found exactly the books I was looking for; with puzzles, riddles, etc. Thank you so much! Dominique Revue posted a topic in Information, Please! They actually did do a TCM premiere of the movie Ecstasy with Hedy Lamar, I think maybe 3 or 4 months ago, and no they didn't edit it, Robert Osbourne talked about it before the movie came on and if I not mistaken mentioned that this was the first time they'd showed it on TCM but they didn't edit it, because they show movies on TCM the way they were meant to be shown...or something to that effect. Nonetheless, I'm not sure if and when it will be on again, but I'm sure you can type in Ecstasy in the search engine and it will let you know if it will be on again soon. Hope this was helpful...? bient?t! 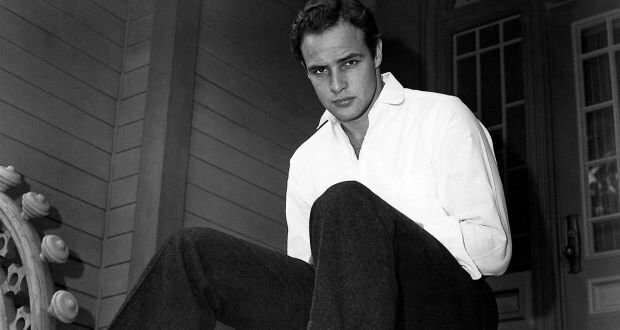 I've recently been informed that the TCM IIPart documentary BRANDO. will be (or has been) released on DVD. However in inquiring about it, I cannot get a correct answer on if it has already came out, or if it's in the process of releasing. Thus far I've gotten responses from "...it came out in Oct. 7, 2007..." to "...sometime in 2010..." I've even went to various websites; Amazon, Ebay, Best Buy, etc. and so far...not so much. If anyone can help me out it would be very appreciative! Thanks ? bient?t! OMG!!!!! THANK YOU SOOOOO MUCH!!!!! I really don't know what to say...I feel a weight lifted! I've been watching classic movies since I was a little girl and just couldn't believe I let one get by me. But now I can out this down in my books of things I shoulda known but didn't! lol...again thank you so much!